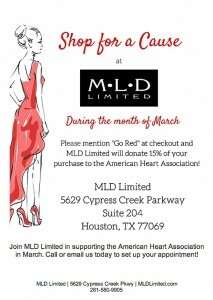 If you haven’t yet checked out the new wedding dress collection from JLM Couture designer Allison Webb at Houston’s Now & Forever Bridal Boutique, now is the time! And while you’re at it, check out this EXCLUSIVE Houston Wedding Blog Q&A with the bridal gown designer herself. You’ll find out what inspires her, which of her new designs are her personal favorites, and how her experience working for a fashion-design legend has influenced her style. 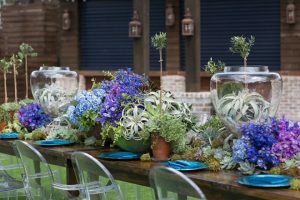 Weddings in Houston: How and when did you get your start in bridal design, and what have been the biggest milestones in your bridal design career? 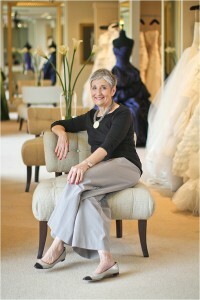 Allison Webb: One of my first jobs involved designing bridal gowns. I worked at J.Crew as a freelance design assistant and helped with their bridal collection. I did everything from draping to embellishment design and layouts. I had always been interested in designing eveningwear, but that was the first time I was exposed to bridal…and I was hooked! The biggest moment and milestone in my career was when I found out that our CEO was giving me my own namesake line. As a designer, it’s something you always dream of and hope for, but doesn’t happen often. WIH: How does your experience having worked alongside design legend Oscar de la Renta inform your bridal design? Allison Webb: The experience at Oscar de la Renta was probably my most informative design experience to date. I spent a year there and it was nothing short of incredible. I learned so much from watching him work and how he approached the design process. My biggest takeaway was that Oscar always had a consistent point of view and didn’t falter from it. He wasn’t interested in doing things because they were trendy; his goal was to make beautiful clothes that made a woman look and feel beautiful. I try to approach my collections in the same way. I want every bride who wears an Allison Webb gown to feel like the most beautiful version of herself on her wedding day. When I design I’m constantly thinking about the customer and how each gown will make her feel when she wears it. WIH: What are some of the most distinguishing features of an Allison Webb wedding dress? Allison Webb: I have clean and sleek gowns, as well as embellished styles, but the common thread that runs through them all is that I try to infuse each one with a “wow” factor. Even if the dress is a simple sheath, I’ll add a dramatic neckline, interesting seaming or a fresh detail to make the gown exciting. WIH: What are you most excited about with your newest collection? 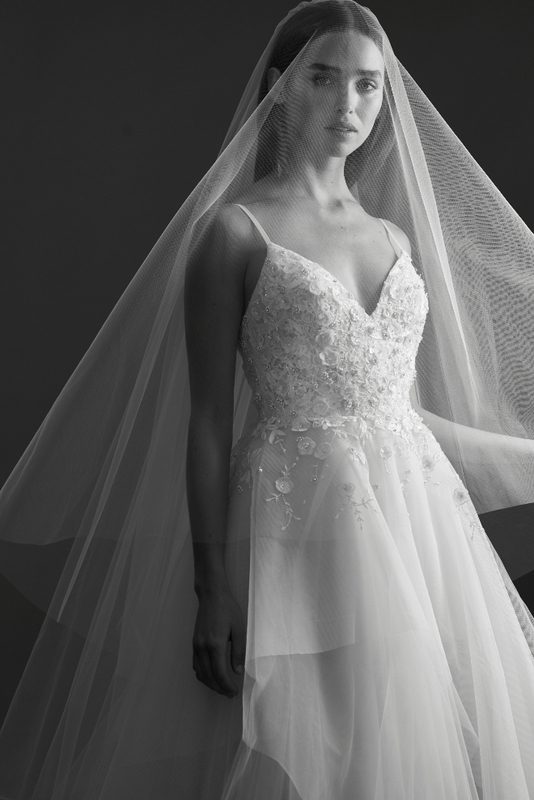 Allison Webb: This season I wanted to focus on classics with a twist, and give brides different styling options. I created pearl tops that the bride can wear for the ceremony, but then take off for the reception. I think it’s a great way to wear the same gown but have two different looks on your wedding day! The tops coordinate with the “Baxley” and “Meredith” gowns, but could be worn with any style. 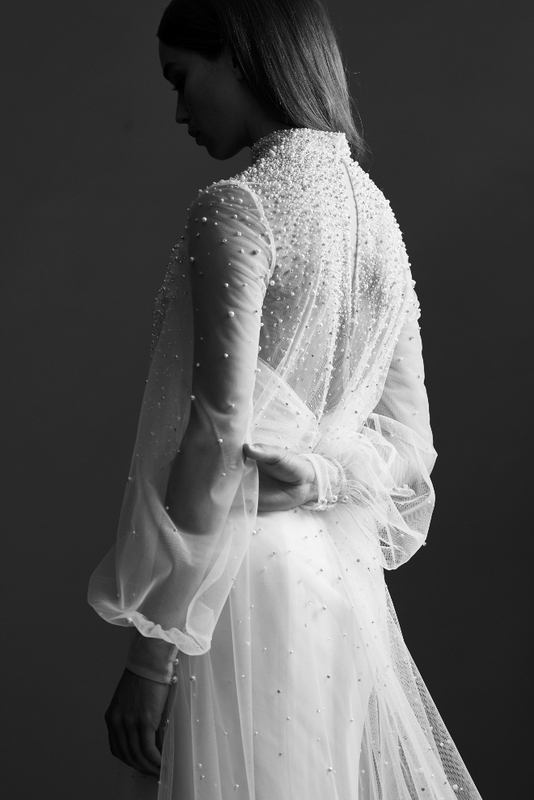 I also love the “Josette” cape–it’s a sheer overlay style encrusted with pearls and crystals that a bride can wear on top of her wedding gown, then remove for a totally different look. I’m loving the concept of separates and empowering brides to be able to create a wedding day look that is completely unique! 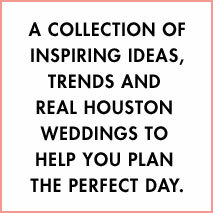 WIH: What, in your opinion, is the appeal of Allison Webb bridal design to Houston brides? Allison Webb: First of all, I love Houston! It’s such a great city. When I think of a Houston bride, I think of a modern, classy woman who wants to look timeless and elegant on her wedding day. I think Houston brides will like the collection because that’s exactly what these gowns are: modern, classic and timeless. Schedule your appointment at Upper Kirby’s elegant and accommodating Now & Forever Bridal Boutique, to experience Allison Webb’s newest wedding dress collection in person. 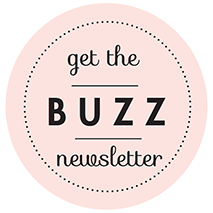 You may just find your “Oh YES!” wedding dress!! Happy shopping, loves.